Located on the middle section of the Southern area of Mogao, constructed in the Early Tang and renovated in the Late Tang, this is a hall cave of medium size with a truncated pyramidal ceiling. The ceiling cener highlight a pattern of two coiled dragon and lotuses with draperies extending to the four slopes. There are asparas flying around the central design (sootiness), and the thousand Buddha motif on the four slopes are black due to sootiness.There west niche with a double-recessed entrance contains a seven-figure group of statues: a seated Buddha, two disciples, and four bodhisatvas (one lost). The walls in the inner niche are decorated with an aureole of flame motifs, halos, and on both sides are a disciple and an apsara. The top of the outer niche is a niche beam decorated with flames and lotuses, and there is an apsara on either side. The west wall in the niche contain a niche pillar and a pensive bodhisattva, while the north and south walls respectively show a bodhisattva. There are six apsaras on the niche beam, who are flying toward the central offerings. The north and south sides out of the niche are devoted to the Conception and the Great Departure respectively, both containing two bodhisattvas in the lower part. Beneath the niche are the offerings flanked by five bodhisattvas on either side.Each of the south and north walls are covered with a central preaching scene amid the thousand Buddha motifs. The south wall also depicts a row of female donors of the Early Tang (blurred) and the opposite north, a row of female donors of the Late Tang (blurred).The space above the entrance in the east wall is divided into the upper and lower sections. The upper is covered with the thousand Buddha motifs and there was a painting of seven Buddhas of the Early Tang in the lower part (destroyed when the corridor was renovated in the Late Tang). The corridor has a tent-like ceiling, which was rebuilt in the Late Tang. In the center is an illustration of the Medicine Buddha. The north and south sides of the entrance consist of three parts: on the upper parts are thousand Buddha motifs, on the middle ones are preaching scenes, and the lower parts are destroyed. In the front chamber, the space above the entrance in the west wall is filled with the Maitreya sutra illustration, which is flanked by the picture of the Vidudabha (king of the south,blurred) on the south side of the entrance and that of the Vaisravana (king of the north, blurred)on the north, all painted in the Late Tang period. On the wall above the entrance in the east wall is the motif of the thousand Buddhas, a preaching scene is painted on either side of the entrance. Originally there were donors painted in the lower part of the preaching scene, now they are all lost. The composition basically follows the pattern of the Sui dynasty: under the bodhi trees is one Buddha flanked by two bodhisattvas. The Buddha sits in the lotus position and preaches. The two bodhisattvas either hold a lotus or touch the scarves. Their bodies bend slightly. 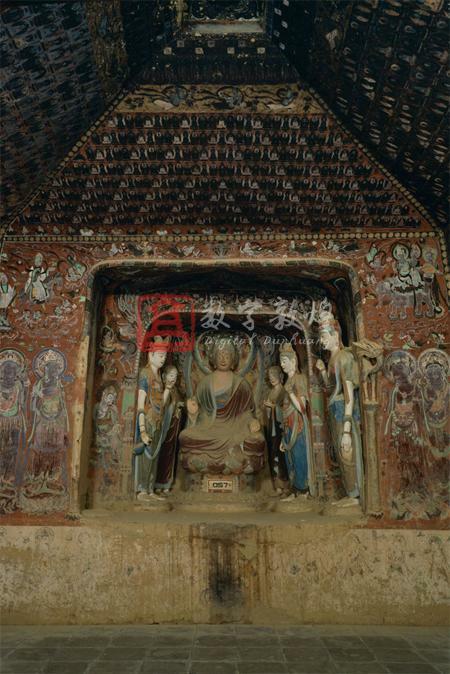 On the south wall, there is a central preaching scene of Maitreya surrounded by the thousand Buddha motifs. On the lower section there were originally a few donor figures (most have been damaged). In this preaching scene, there are more than sixteen figures including the Buddha, bodhisattvas and disciples. Only the head or half body of the other figures are visible except the central Buddha, the two large-sized bodhisattvas, and the relatively small-sized heavenly kings. Under the parasol in the center, Maitreya Buddha sits in lotus position on a lion throne and preaches. He is flanked by two disciples, the eldest Kasyapa holding a bottle and the youngest Ananda holding a bowl. The two bodhisattvas look at the audience, the one on the left wears a crown with an incarnated Buddha image and necklaces. The three other bodhisattvas behind only have their heads painted, all beautiful but looking different. The one closest to the Buddha holds a lotus in hands, her head tilts sideways at the audience, looking very lovely. The guardian warriors are short, upper bodies naked and barefoot. With massive muscles, wide open eyes and mouths, holding vajra in hand, they look powerful. There is an apsara on either side of the Bodhi tree in the upper picture. They fly freely with the rolling clouds. There donor figures at the bottom of the south wall were painted in about the Late Tang, most of them are vague. The two donors kneel on a square rug with incense burners in hand and look pious. There is a deep niche with double recesses in the west housing a seven-stucco group of statues: a central Buddha, two disciples and four bodhisattvas (one of them is damaged). The central Buddha wears a kasaya and a sanghati inside and a spiral-shaped coil on the head. He looks straight ahead, looking solemn. The folds of the kasaya are natural and close to the body. The shallow waving folds of the kasaya are realistic. Kasyapa wears a kasaya, hand over hand in front of the chest, and looks into the distance. Ananda wears a kasaya, clasps his hands, looks downward piously. The bodhisattva on the south side in the niche has a plump face. He holds a flower in one up hand, and a bottle in the other, with the upper body naked and lower body in skirt, looking slim and graceful. The one on the north side in the niche wears a high chignon (his crown is lost) with a plump face and down cast eyes. The bodhisattva with luxurious ornaments on the outer recess looks slim and solemn. The wall of the inner niche is decorated with an aureola of flame motifs and a halo. Disciples and apsaras are depicted on either side. The halos are rendered in simple forms, most of them only have one circle. The ceiling of the inner niche shows two flying apsaras scattering flowers to the side of the aureole with flame motifs, and the beam of the inner niche forms the ceiling of the outer niche. The upper part of the beam is decorated with twisted honeysuckle motifs, curve-petalled lotuses and incarnated children. On either side of the beam is an apsara. Out of the inner niche there is the niche beam and pillars with a dragon head. Below the dragon's head is a boy seated on a lotus with a lotus in each hand. The both sides of the outer niche each depict a pensive bodhisattva respectively above Vasistha and Mrgasirsa. The pensive bodhisattva wearing a three-pearled crown and sitting on the lotus throne, one hand supporting his head and one hand touching his foot. His head turns aside as if he was thinking. Vasistha with whiskers holds a bird in one hand showing his nature as a killer and looks greedy. There is a bodhisattva painted on either side out of the outer niche.The two sides out of the niche are the niche pillars with a dragon's head, which are molded and painted (the one on the south is lost) and the niche beam tied with silk. The south and north sides out of the upper niche altogether depict six lively apsaras flying one after another towards the central offerings. With their upper bodies naked and lower bodies in skirt, they hold lotuses and flow rapidly. Among them there are two bhiksus in kasaya flying in the procession of the aparas along with the floating clouds. This echos with the group of apsaras flying along the brim of the ceiling. The upper parts of the north and south out of the niche respectively depict the Great Departure and Conception. The Conception tells that Sakyamuni's mother, Lady Maya, dreamed of a six-trunked white elephant, then got pregnant and gave birth to Sakyamuni. The bodhisattva riding an elephant in the painting walks slowly, led by apsaras scattering flowers in the front and followed by musicans playing the music. There are even two celestial beings standing on the two long trunk of the elephant playing music. The Great Departure on the south tells the story that Prince Siddhartha grew up and experienced the birth, aging, disease and death in the world, he kept thinking the way of getting out of these pains and finally decided to renounce the secular world. In this picture, the prince rides a horse running rapidly, while four devas each support one of the hooves. The lower part on the north side out of the niche depicts two slim bodhisattvas standing on lotus platforms. They have a plump face and wear a treasured crown, brilliant halos, and necklaces and other ornaments, looking glittering and magnificent. There two bodhisattvas on the lower part of the south side out of the niche also stand on a lotus platform and wear luxurious clothes. The one on the right side tilting slightly backwards has a plump face and looks solemn. The layout of the north wall is similar to that of the south wall: a central preaching scene is surrounded by the thousand Buddha motifs. The murals on the upper part have become black due to the soot from candles and incense, and the donors on the lower part are also blurred. The central preaching scene is well preserved: the central Buddha Amitabha sits in the Lotus position and preaches with hands raised. The disciple on the right side is Kasyapa in kasaya who holds fresh flowers in hands and listens attentively; the disciple on the other side is Ananda who looks piously at the Buddha with a long-stemmed lotus in hands. Next to Kasyapa is Avalokitesvara who holds a bottle and looks at the Buddha sideways with slightly downcast eyes, looking peaceful. Mahasthamaprapta faces the audience, one hand up and one hand naturally hanging down pendent, looking downwards. The ceiling center highlights a pattern of two dragons coiling around the center, head to head and tail to tail. Out of the square ceiling center are four decorative circles, first the pearled circle, then squares and half squares, scales, and then pearled circle. On the outermost frame are the triangles and draperies that extend to the four slopes, forming a parasol. Due to the sootiness, the paintings have been blurred, but still visible are apsaras flying fast one after another amid the clouds. Some of them try their best to fly forward, some turn back to scatter flowers. Their bare feet show up from their skirts, and the scarves and skirts wave in the breeze, forming a sharp angle at the end. Two Buddhist monks (bhiksus) in kasaya hold an incense burner in hands, looking piously at the Buddha. On the wall above the entrance in the west wall is an illustration of the Maitreya sutra with the Vidudabha (king of the south) on the south and the Vaisravana (king of the north) on the north , all painted in the Late Tang period and blurred.